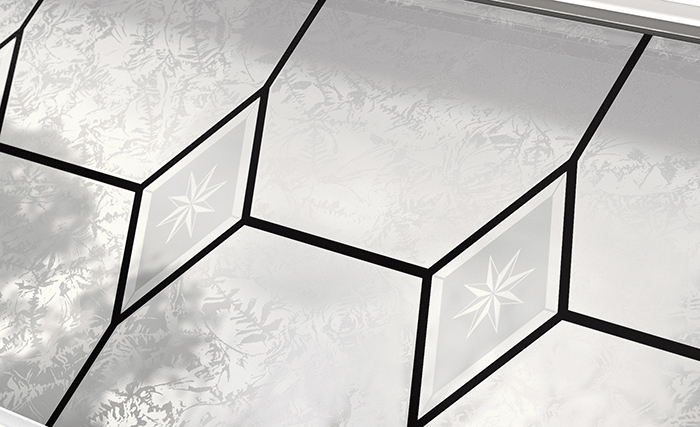 Our Printing Process collection creates the impression of rich stained glass without real soldering joints. This is achieved through our unique manufacturing technique of printing in antique gray ink on the inside surface of the glass. The panes have a textured coating which creates the effect of sandblasted glass, offering varying levels of privacy. For this model, the window is inserted into a seamless, one-piece (molded in a single casting), polypropylene frame, at the factory. Model Size 21" x 13" Size 40" x 13"
To view all our window models in the Printing Process family, simply use our Design Centre. This way you can create your next dream garage door!